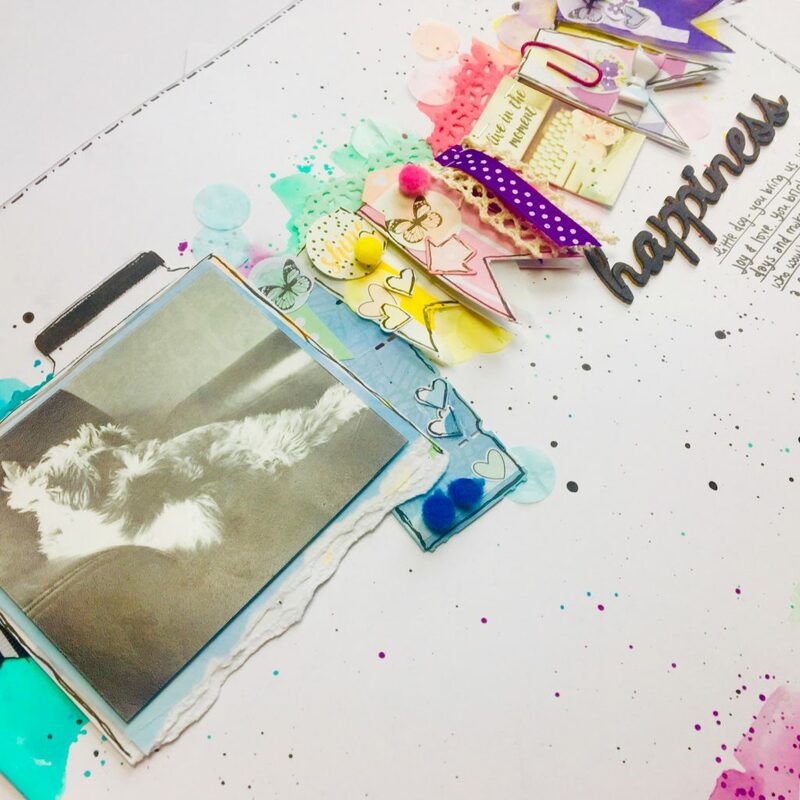 Hello lovely Lollipops, I am back on the blog to show you all the second layout that I made with the gorgeous “Planner Girl” kit. For this layout I wanted to make a banner style page, using all the bits and bobs that came in the kit, including the tiny pom-poms. They are so cute! 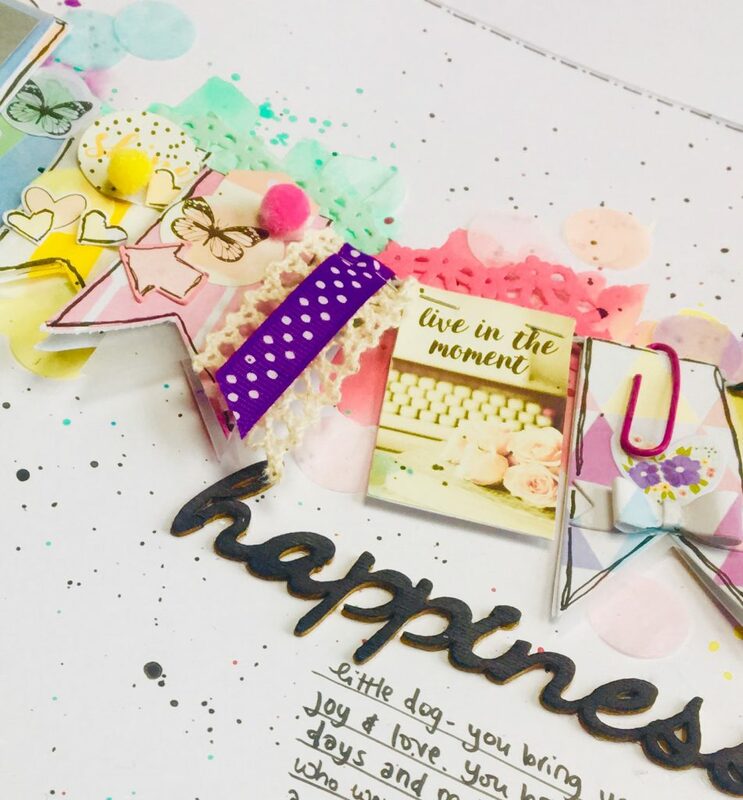 I have loved all the colours in this kit, I love bright colours and I am really enjoying bright pages and designs that are so popular at the minute. I used my distress inks to add coloured blobs to the bottom of my page and added a length of the washi that came in the kit along too. I also popped some black and white striped washi from my stash on the page and added some stamping detail on the right hand side. To make my banner I cut a pennant shape from some card and then used this as a template to cut the papers. I also used a ticket punch and some of the lace from last months kit and the ribbon from this months kit to make some different shaped banners to add some more interest to the page. I made another banner from some black and white trim from my stash and the final banner is made from a sticker from the Simple Stories sticker book add on. I attached all these banners to a length of twine and positioned them on my layout and then very carefully added some ink blobs behind these. I backed my picture on a double layer of the beautiful blue paper from the kit and tore the bottom edge of the mats to add some texture. One everything was dry and stuck down I added the embellishments to the banners, sticking the pom-poms on with glossy accents. I kept things in colour groupings again as I did on the last layout. 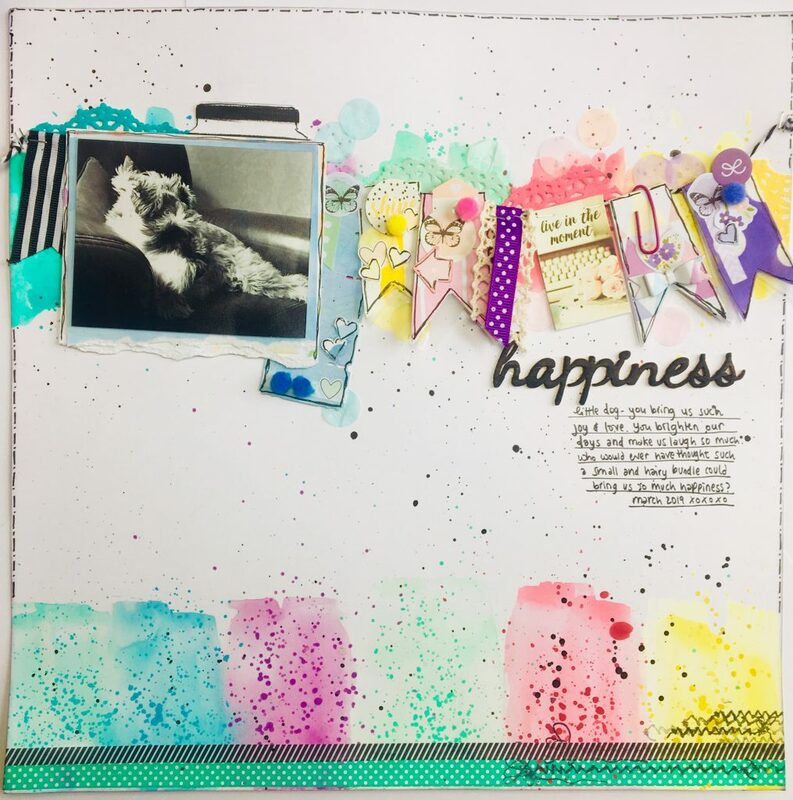 It’s a very easy way to get some cohesiveness on a busy mixed media page. One this was all done, I found the word ‘Happiness’ in my wood veneer stash pile and inked it up with black ink. I then drew some messy journalling lines on the page and added my words, finishing off with some black splatters. This page was a lot of fun to make – I hope that you like it. This is my last page for this month. I will be back later on in April with kits made from the new “You are my Sunshine’ kit which looks stunning.